Angel was a spin-off of The WB’s hit series Buffy The Vampire Slayer, which debuted in 1997. No pilot was filmed for Angel. Instead, a “pilot presentation” was shot on location in Los Angeles by a “skeleton crew” only days before The WB’s upfront presentation . With the series already picked up for the 1999-2000 season, the only question was whether The WB executives would decide to air the two shows back-to-back on Tuesdays. Ultimately, they did. The presentation was screened at the network’s upfront presentation on May 18th, 1999. 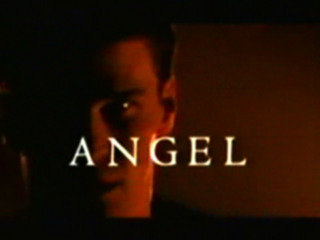 Afterwards, creator Joss Whedon told potential advertisers that Angel came about because “it occurred to me there was another story that needed telling” . The presentation runs just under six minutes and introduces the show’s concept and characters, using plenty of footage from Buffy The Vampire Slayer. The premiere episode of Angel (“City Of, originally broadcast October 5th, 1999) basically an expanded version of the presentation. In fact, the very last scene is lifted directly from the presentation with added voiceover. Several other scenes from the presentation would be re-shot for the first episode of the series. 1 Fretts, Bruce. “City of angel.” Entertainment Weekly. 21 May 1999: 40. 2 Barnhart, Aaron. “Upfront and hyping: Networks try to sell advertisers on their new seasons.” Kansas City Star. 7 Jun. 1999.